Matthew Spender - on form | sculpture: the showcase for contemporary sculpture in stone at Asthall Manor, Oxfordshire. I’m a direct carver, in that there’s an idea, a drawing, and finally a stone. In the end it’s the stone that tells you what to do, a factor which tends to withdraw if you use assistants and disappears entirely if you use machines. Unfortunately, it’s a young man’s art. Bad knee bad back – it all mounts up. I shall keep going as long as possible, and there are still plenty of ideas I still want to pursue. Of the work at on form 14, Campionessa (The Bike Girl) comes from a period when I taught sculpture at the main art school in Pesaro. I noticed the students were much happier outside on their bikes than inside and working. The bikes looked like altarpieces round which these acolytes met, with occasional glances up at the sky for divine illumination. The Madonna and Child was cut from a huge shard discarded by the Carrara workshop where I was working. I couldn’t let it go. The references are Byzantine. I’ve always admired the generic ‘garden sculpture’ of the eighteenth century. Art in ‘tamed’ surroundings has been produced since Hadrian built his swimming-pool, but I don’t think the tension between green trees and architectural formality has been exhausted yet. The son of a poet and a musician, Matthew was born in London in 1945. He studied modern history at Oxford and art at the Slade School of Fine Art. In 1968 he moved to Italy with his artist wife, Maro Gorky. 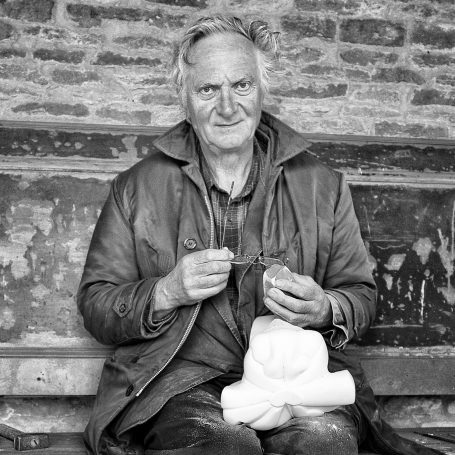 Matthew started his career as a painter but since1990 has dedicated himself to sculpture. Among his principle collectors are Francis Bacon and Bernardo Bertolucci, who used 47 of Matthew’s sculptures in his film, “Stealing Beauty”. Drawing on Italy’s rich sculptural tradition, and the proximity of Carrara to his Tuscan home, Matthew has worked in marble, travertine and wood. His subject matter ranges from the Vespa to the human form. His work has been shown throughout Italy and in 2008, he had a major retrospective at the Castello Sforzesco in Milan. Matthew holds two professorships in Florence and Cararra.